Grand Island’s Jimmy Arias, a tennis prodigy in his youth, evolved into perhaps the rarest of all athletic phenomena; a child star who, instead of “achieving” burnout by his teens, developed into the type of player his early talent predicted. Jimmy dominated juvenile tennis in Western New York in the 1970s. As a pre-teen, he began to accumulate state and national trophies in the 14 and under age bracket, frequently besting players two or three years his senior. It soon became apparent that in Buffalo, only top adult players such as Charlie Garfinkel and Rev. Hetherington could provide meaningful competition. Jimmy’s father, Antonio, realized that his son’s career had reached a cross-road, and that that career could progress only if Jimmy left Buffalo in search of world-class competition. Accordingly, at age 13, Jimmy moved to Florida to train with established pro Nick Bollettieri. The young star thrived in a more competitive environment, and soon once again found himself beating older players. The march to stardom had begun. By age 14, Arias was competing with college stars. At 15, he became the youngest ranked player in the world, and turned pro a year later. 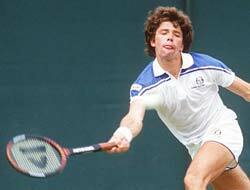 In 1980, at age 16, he became the youngest player to play in the men’s singles competition at the U.S. Open. In 1982, his ranking on the pro circuit jumped from the 70s to the top 20, sparked by runner-up showings at Indianapolis and the National Bank Tennis Classic in Washington. The full blossoming of Jimmy’s career occurred in 1983, as he captured 4 singles titles, including the U.S. Open Clay Courts Championship and Italian Tennis Championship. He also reached the semi-finals of the U.S. Open singles competition and finished that year ranked 5th in the world, behind only McEnroe, Wilander, Lendl and Connors.